Beets are one of those things that people either love or hate, kind of like boy bands or the Twilight series. I, for one, am definitely in the “Team Beet” camp, and so is my toddler. I don’t know what it is about them, but they just scream summer to me. Maybe it’s because their smell reminds me of cut grass, or their bright color is worthy of a beach ball, but as soon as the weather starts getting warm, I crave them in my salads and pastas. 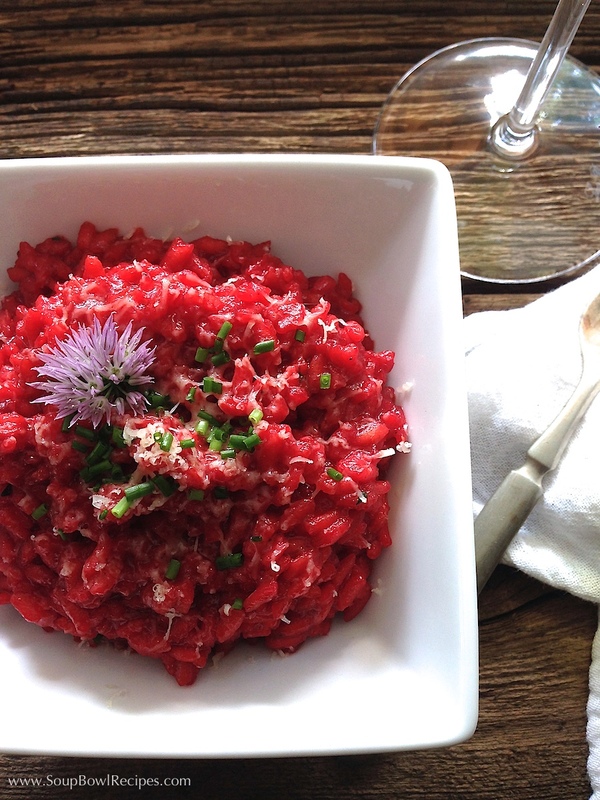 I served this beet risotto to my family last week and when my toddler saw the colorful rice she said, “Oh Mommy, I’m going to eat all of my dinner tonight!” — and she did. In a food processor or blender add beet and 1 Tbsp. oil and blend until smooth, set aside. In a saucepan, bring stock and wine to a low simmer. Meanwhile, over medium-low heat, melt butter and oil in a large straight-sided skillet until bubbly. Add shallots and cook until tender, about 3-4 minutes. Add risotto and garlic and cook for 1 minute, stirring occasionally. 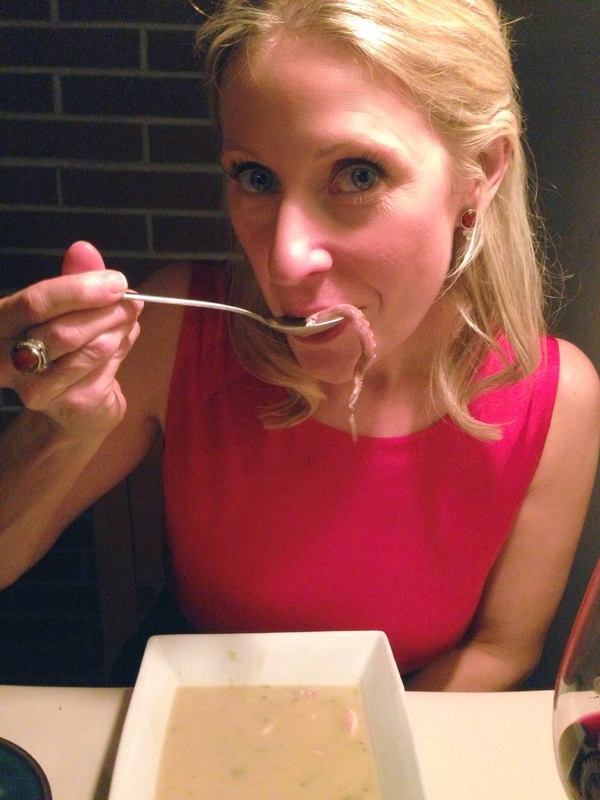 Using a large soup ladle, pour 1 ladle-full (about ½ cup) of stock into risotto and stir until liquid is absorbed. Gradually stir in remaining broth 1 ladle-full at a time, cooking and stirring until liquid is absorbed before adding the next ladle. Continue this process until all but 1 ladle-full of stock has been used, approximately 25-30 minutes. Add the last ladle of stock with puréed beet, stir, then reduce heat to low and cook for 5 minutes, covered. Uncover and stir until all remaining liquid has evaporated, about 2-3 minutes. Season with salt and pepper, and garnish with a sprinkle of chives and grated parmesan. 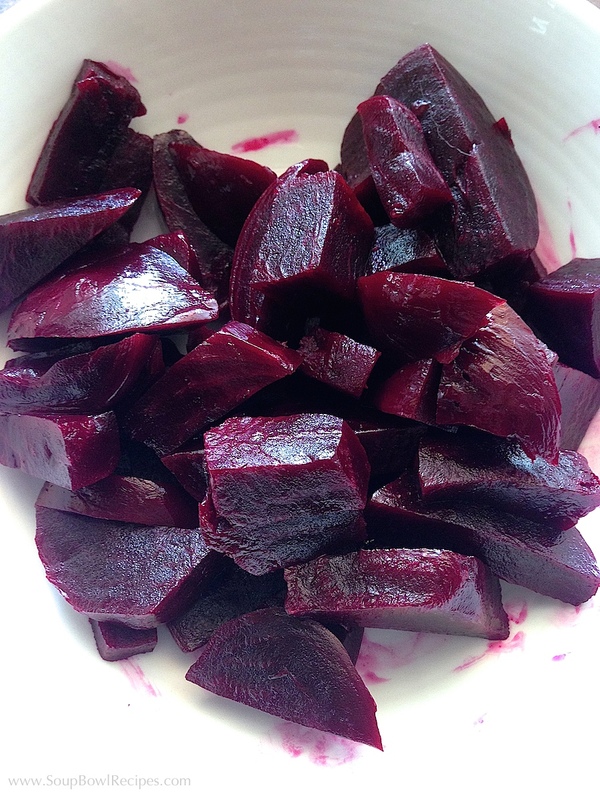 Tip: Beets can stain hands, clothing, cutting boards, and light-colored sinks and countertops. To avoid turning everything in your kitchen red, wear cooking gloves while handling beets, and peel over an open plastic bag set in the sink. 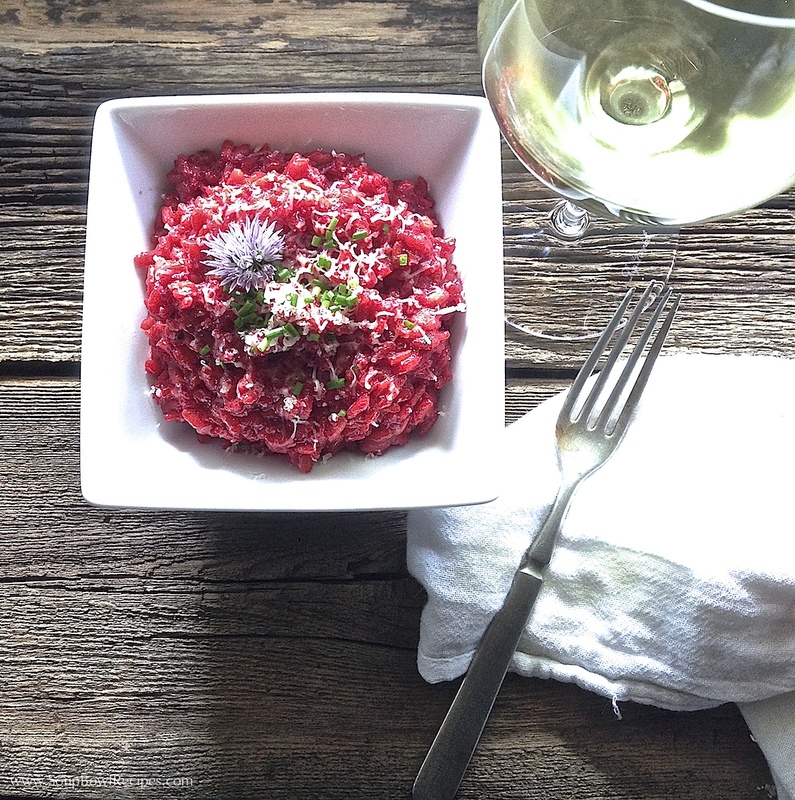 Sidekick: Serve with a chilled glass of Riesling, Chablis, Rosé, or Pinot Blanc.